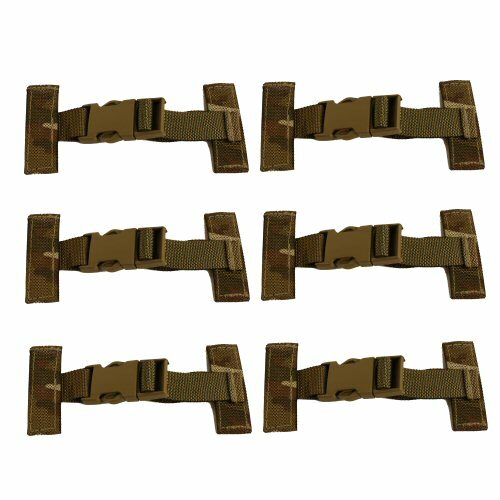 Pack of 6 genuine British Forces issue T-Bar keeper sets for Mk4 Osprey Armour vest. The keeper set consists of two parts. Each part has a section of 25mm webbing, reinforced with flexible vinyl, measuring 7.5cm long. This forms the top bar of the 'T'. The shank of the 'T' is formed from a section of 25mm webbing, sewn in the middle of the top bar, onto which a 25mm quick release buckle portion is affixed. For the female or negative end, this is a fixed loop of material. For the male or positive end, this is approximately 14cm long, with buckle end able to adjust to length, and terminating in a rolled end which helps to catch the buckle and prevent it from being lost. The web straps are all printed MTP Cordura on one side, with dark khaki on the reverse side. These are useful for inserting in between the horizontal straps of MOLLE webbing on the vest base or panels, and add reinforcement and strength to the attached panels. Being able to unclip the two parts makes it possible to use the T bars on parts of the vest which need to be opened periodically, such as the waist wraparound portions of the vest under the ops panel. Please note the the price is for six sets, which includes both the female end strap and the male end strap.